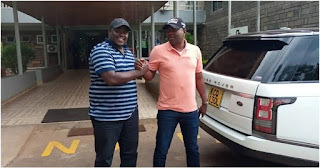 Monday August 13, 2018 - Kakamega Senator Cleophas Malala and Sports Cabinet Secretary, Rashid Echesa, have buried the hatchet and are now friends again after months of bitter confrontations and insults that had also put their supporters at odds. The two politicians met over lunch in Kakamega to talk about their differences and resolved to put an end to their ugly public spats for the sake of unity of the Mulembe nation. In a Facebook post, Malala disclosed that he and Echesa had agreed to forget about their bitter past and work together towards uniting the Luhya community. “We agreed to let bygones be bygones for the unity of the Mulembe nation," said Malala. The meeting comes after the supporters of the two politicians clashed over the troubled sugar sector in Western Kenya. It also comes after Echesa rattled Malala by attacking NASA leader, Raila Odinga, accusing him of trying to have him sacked from the Cabinet for being close to Deputy President William Ruto.